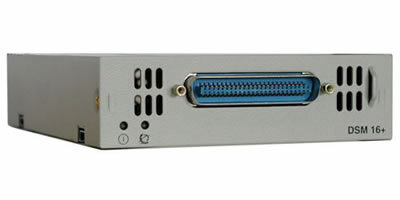 The Nortel BCM Digital Station Media Bay Module DSM16+ supports 16 digital telephones through one RJ-21 connector. Set the double density switch to enable the DSM to carry 16 extensions over a half DS30 bus. If required, install a second DSM16(+) and set the double density switch to occupy the second half of the DS30 bus to expand the number of extensions to 32. The Nortel BCM Digital Station Module 16 supports 16 digital telephones through one RJ-21 connector. Set the double density switch to enable the DSM to carry 16 extensions over a half DS30 bus. If required, install a second DSM16(+) and set the double density switch to occupy the second half of the DS30 bus to expand the number of extensions to 32.